◦ Anterior blepharitis. The two most common causes of anterior blepharitis are bacteria and a skin disorder that causes itchy, flaky skin called seborrheic dermatitis. 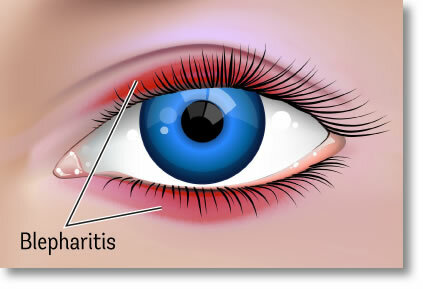 Anterior blepharitis usually occurs near the eyelashes and affects the front of the eyelids. ◦ Posterior blepharitis. This condition is usually caused by problems with the oil glands in the lid margin, and is often associated with acne rosacea and dandruff on the scalp. It affects the inner surface and the edge of the eyelid that comes into contact with the eye. • Wash your eyelids with a mixture of diluted baby shampoo and warm water. • In some cases, artificial tear solutions may be prescribed. • The eyelids may need to be massaged to wash out oil accumulated in the eyelid glands if the glands in the eyelids are blocked. • Using an anti-dandruff shampoo on the scalp can also help. • Using eye makeup will make lid hygiene more difficult, and limiting or stopping its use is recommended.